Twenty women have stepped forward with charitable donations to help the Paro Centre for Women’s Enterprise (Paro) launch the PARO Charity Fundraising Campaign. Rosalind Lockyer is the founder and Executive Director of Paro which has has peer lending circle networks all across Northern Ontario. 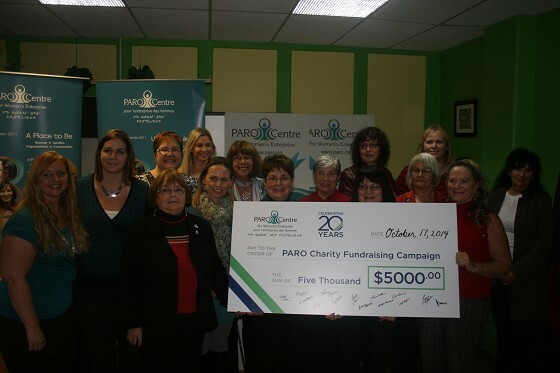 Since 2009 Paro has provided over $4 million to women including $2.5 from Paro and the rest from other programs like Northern Ontario Heritage. “ Our philosophy is to give back to other women and the community. We are thrilled to have women give back to others and our community today.” said Lockyer. Paro is celebrating its twentieth year by hosting Exceeding the Vision- a full day networking and tradeshow event. Suzanne Tighe is the Event coordinator for Paro Centre 20th Anniversary which will be held on Thursday November 13th. Paro will celebrate their 20th Anniversary with a trade show and luncheon with speaker Buffy St Marie. There will be Power Panels in the afternoon. In the evening Paro will celebrate the Top 20 in 20 awards to outstanding women from the last 20 years.